Last year, when Ad Astra 2010 was complete and my editor and I had shaken hands and drunk wine to seal the TRIPTYCH deal, I came back to work flying high on happy. 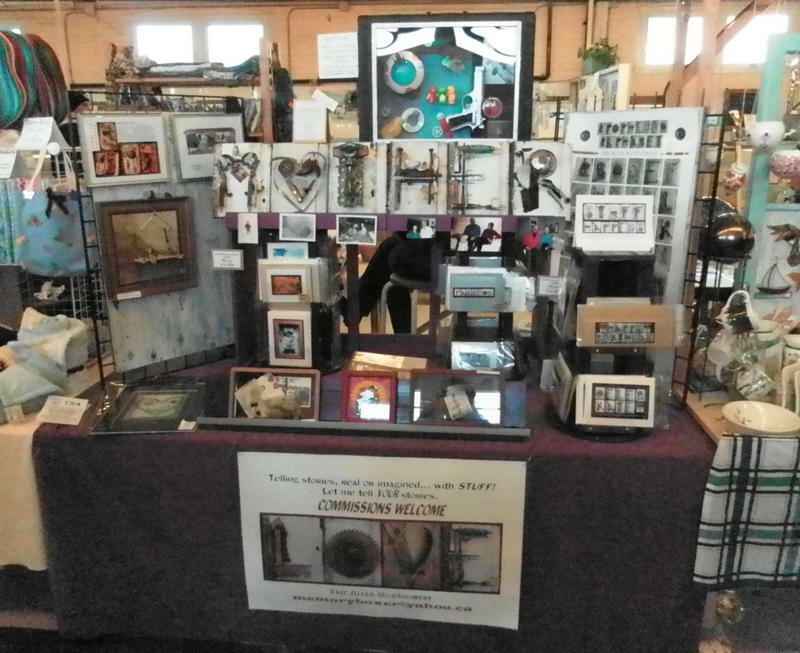 I was working as the Outreach Coordinator at the Elora Centre For The Arts, and I was helping prepare for the first annual ArtCetera Art Auction. 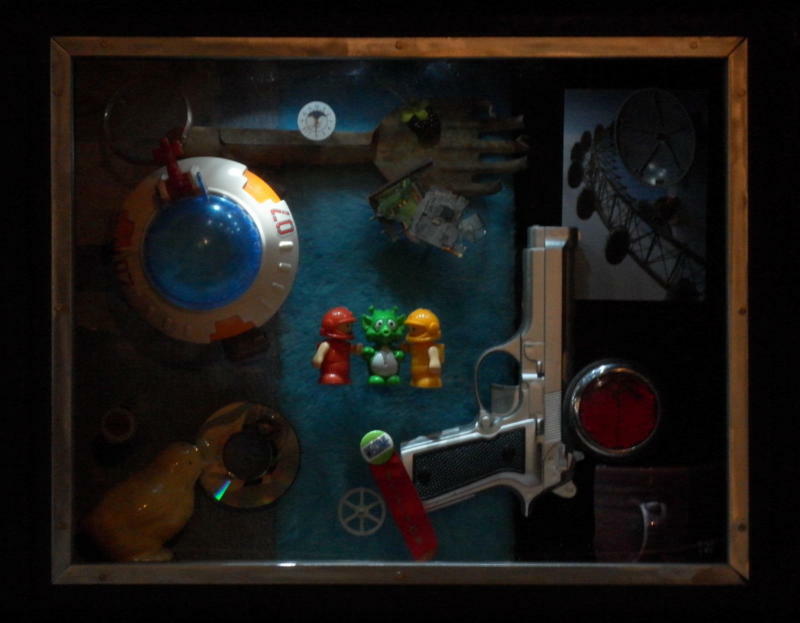 While working with the incoming artists and art, I met Eric Allen Montgomery, a fun, enthusastic and ecclectic gentleman who does the most amazing steampunky Mixed Media Collages, in a format he calls Memory Boxes. The idea is that he creates an art piece based on a moment, a memory, and a fond thought. He’ll take items you give him, or things you describe, and create a piece that tells the story of that moment. For example, he has a lovely one for a fellow’s wedding, where there’s rice stuck to the inside of the glass, photographs of the couple in their car, a toy replica of the car, and pieces of fabric from the bride’s gown. 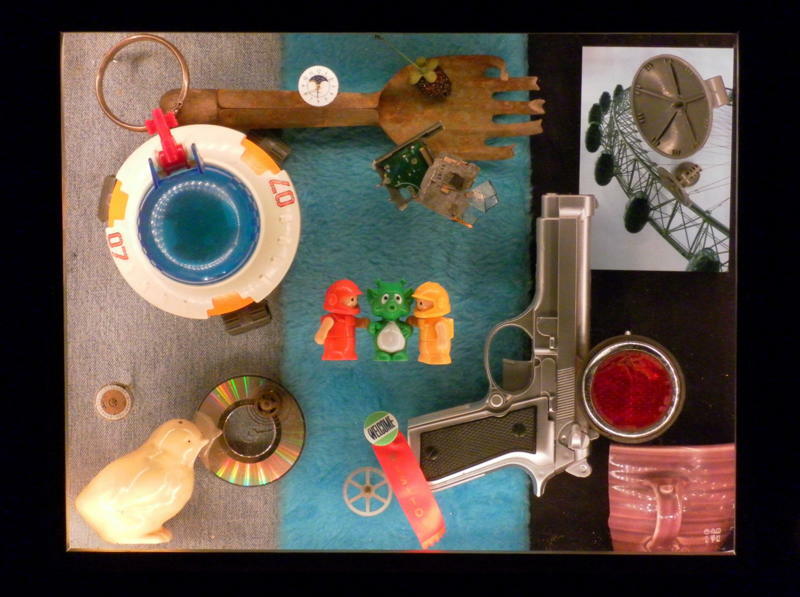 Part of the inspiration for TRIPTYCH comes from some playmobil toys I had as a child. There was a moon exploration set, and there were aliens and UFOS, moon rovers, bases, satelites, and scientists. I remembered that each figurine had a smile on their face, and that you could click the scientists together with the aliens and make them hug. There were no guns, no frowns, and each figurine could sit in the other’s ships and bases. 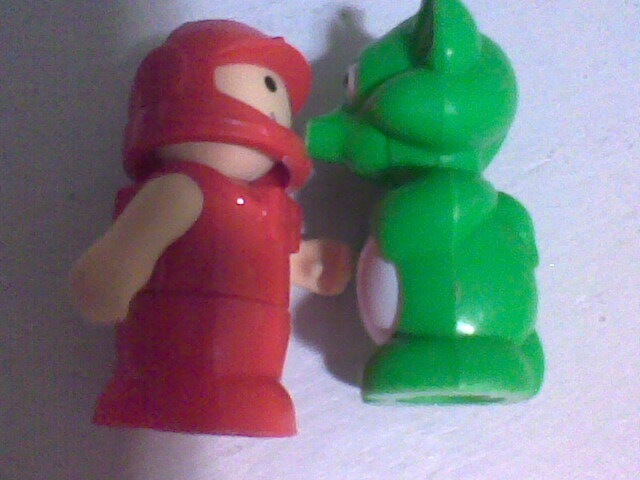 It was a lovely alternative to the toys where aliens are Othered and the figures are all soldiers with fire arms. When I signed TRIPTYCH, I pulled the toys out of the chest, where they had been languishing in wait for little cousins and neighbour’s baby’s to love them again on visits, cleaned them up and brought them to work to sit on my desk. Eric came in with one of his pieces for the auction, and when I saw what he had done, I knew that I just had to comission him to create something special for me to commemorate my first novel. The full memory box, which is in a small suitcase that I can carry around. It’s lit up with a string of LED lights around the inside of the glass window. 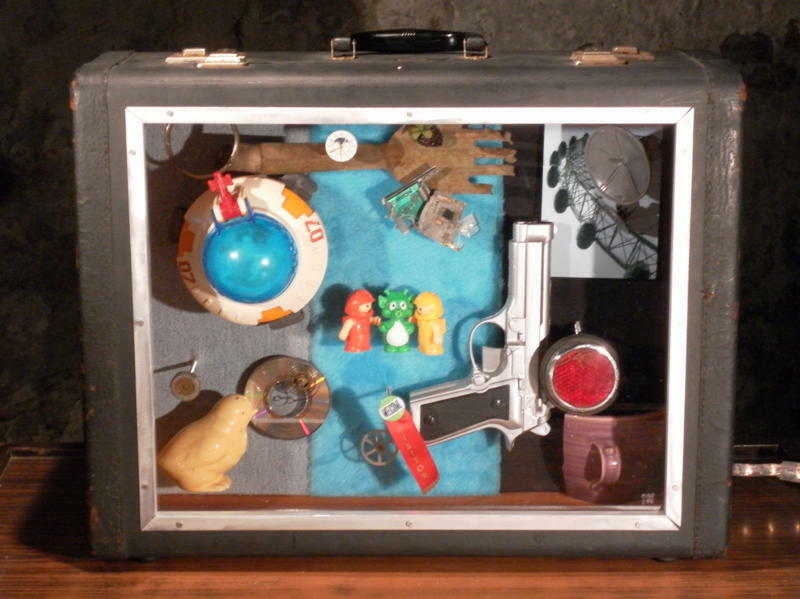 Here is a clear image of all of the items in the case. Trust me, the will all make sense once you've read the book! The piece also has a second "mood light" . The whole case is designed to hang on the wall, too, so I can use it as an actual lamp. A close up of the art itself with the mood lighting on. Eric Allen Montgomery is available for Comissions. You can contact him at:memoryboxer@yahoo.ca AND view his MEMORY BOXES and sculptural work here. Or, if you are in the area, swing by the Guelph Farmer’s Market (which has an arts and crafts aisle) and meet Eric yourself. He’ll be the guy in the purple tam! The TRIPTYCH Memory Box hanging out at the Guelph Farmer's Market, waiting for me to pick it up.